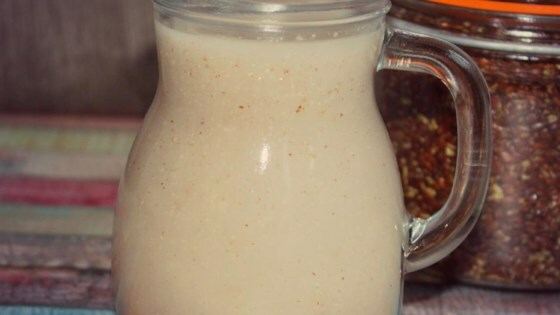 "DIY flax seed milk can not only save money but also keep you from using the store-bought kind with chemicals and additives. Adjusting the amount of water used can also produce a thicker outcome giving you a creamier texture to use in place of cream in recipes." Blend flax seeds and water in a blender on high for 1 minute; allow to rest for 2 minutes. Blend again on high for 1 minute; allow to rest for 5 minutes. Blend again for 30 seconds. Pour milk through a nut bag or a strainer lined with cheesecloth into a pitcher or glass container; press solids with back of a spoon to extract liquid. Gather cheesecloth around solids; twist and squeeze to extract all the liquid. Store in the refrigerator for up to 3 days in an airtight container. Flax seed has a gelling effect so give it a good shake before using. Use the flaxseed pulp in another recipe but don't throw it down the drain, it has a gelling effect that will clog pipes. Use a tablespoon of dried pulp in your gluten-free baking to aid in binding and boost your fiber.